All eyes will be on you in this elegant strapless floor-length Theia gown. Play up this graceful neckline with a simple bun or ponytail and a bold necklace. Floor length, three lengths available. Petite measures 56" from shoulder to hemline (recommended for heights under 5'2"), Regular measures 58'' from shoulder to hemline (recommended for heights 5'2''-5'6''), Long measures 61'' from shoulder to hemline (recommended for heights 5'7''-5'11''). Green and white jacquard (100% Polyester). Sleeveless. Straight neckline. Full skirt with side pockets. Hidden back zipper with hook-and-eye closure. Fully lined. Bonded bodice. Internal bust corset. See size and fit tab for length. Imported. The entire transaction was extremely easy. 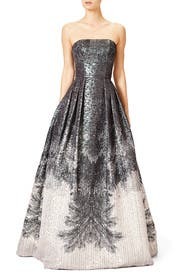 Access to designer gowns for an affordable price. Fit was spot on for this gown. 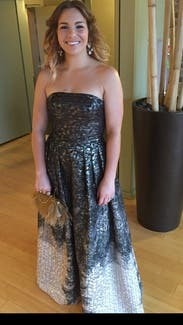 I felt like a modern princess! Pockets. Brocade. So much more beautiful in person. I wore this to my wedding. The color is absolutely beautiful, it changes as you move. The fabric itself has a clear plastic-y design that you can't see until the light catches it. It was much much longer than I expected. 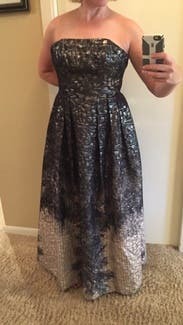 This dress fit perfectly and the fabric looks just like in the pictures. The length is to the floor, so you can wear any shoes to be more comfy as long as there's a little heel (I actually wore my everyday casual boots so I could dance the night away). Beautiful dress. I got so many compliments!! This dress was a show stopper!! 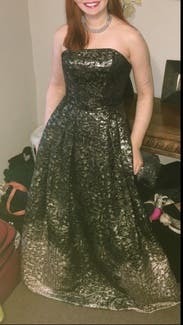 I received compliments all night and felt absolutely gorgeous! The dress for like a dream. Covered any extra tummy issues and was a serious wow factor. Best part - you don't need a bra and you can wear whatever shoes you want because you can't see them. Woohoo! I felt like I had stepped out of a fairy tale. 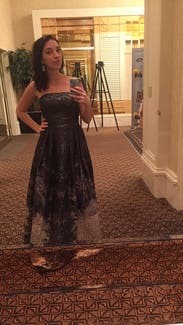 This dress made me feel beautiful. You can't go wrong. Length was perfect! The dress may run a little small since I usually wear a 4. It was so easy to wear and comfortable. No green color in my opinion though and this is categorized as a green dress. I wore very high heels to make the length right and it still went right to the floor. I probably could have gone with a regular length. I usually run between a 4 and a 6 and I got the larger size just to be sure. 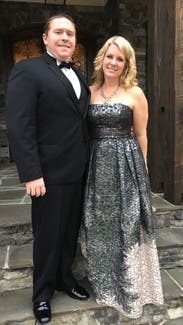 It was perfect for the military ball especially while walking in the 15° weather. It's very warm but still good for dancing in a crowded room. And it has pockets!!!! I was able to keep my phone and ID with me and it didn't bulge at all. My only complaint is that I ordered the long version (recommended for people 5'7" and above) so it was a little long with 2" heels but still manageable. I didn't want to take this dress off ever honestly. It fits beautifully and stays up better than any strapless dress I've ever worn. Amazing dress: bodice is corseted it fits a little small. 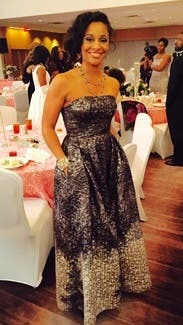 The dress felt amazing and is glamorous! I'm 5'7", 138 lbs and I could have used a 8L for length and bodice fit. Will recommend this dress for anyone. LOVE, LOVE, LOVE. 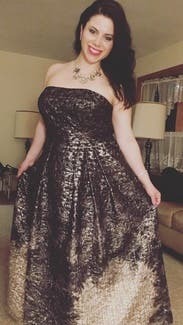 This is a stunningly beautiful dress and I felt incredible in it. 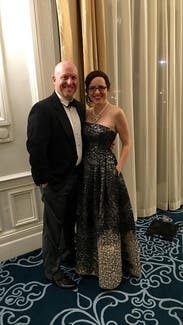 We attended a gala at the end of February and the metallic and somewhat wintery look to it was perfect. Description says it has green in it but it's more metallic and silver. I had a baby 3 months ago and so my body isn't yet back to pre-baby size, hence its hard for me to say if the dress fit true to size. I ordered a 4R and 6R and the 6R barely fit. But I love how the interior bustier kept the dress up- I never felt like it was falling down my chest. 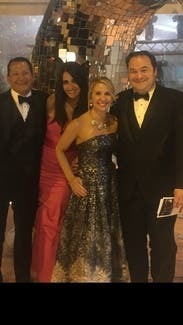 I wore 1.5 inch heels and the dress skimmed the floor. 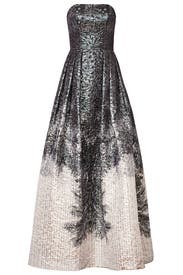 This is a fabulous dress! 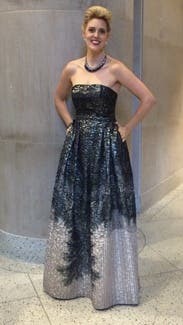 I received compliments on this dress all evening! This dress is made with a beautiful thick fabric and the color is stunning. 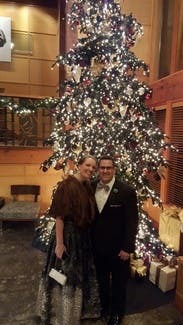 I was stopped all evening with compliments on the gown. I highly recommend this dress! 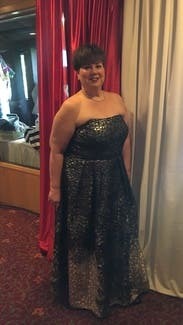 Gorgeous dress and felt fabulous and received lots of compliments! I normally wear a 4 and this fit true to size. The pockets held my lipstick, powder and phone so I didn't need a purse! No bra required because of the thick fabric and strong bodice. Length was perfect with approx 3 in heels. If you want to feel like a princess, this is the dress for you! 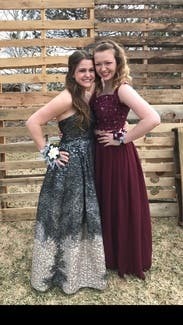 I'm 5'7, so I couldn't wear heels with this dress so this was fine for me but if you want to wear heels and you're over 5'7 this may not be the dress for you. 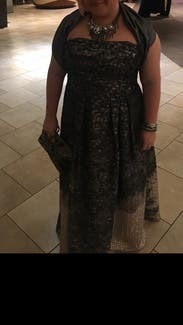 This was my backup dress that I got at the Vegas RTR due to my original dress not working out...so I couldn't wear my normal size (4L). 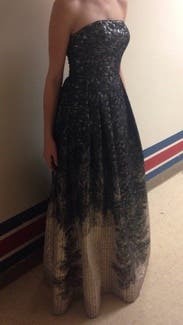 I loved this dress and I am so happy that my original dress didn't work out. Plus a little girl told me I looked like a princess, so it's a win-win. 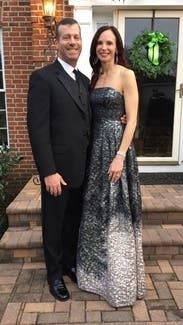 The dress was unique. The ombré effect at the bottom made it current but the top is classic! Fits small . I'm usually a 4 but went to a 6 in this to breathe better. It's shimmery and eye-catching! 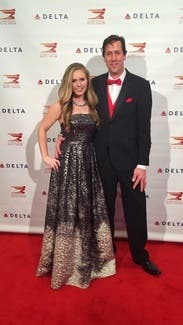 I wore this dress to the NAIAS Charity Preview. 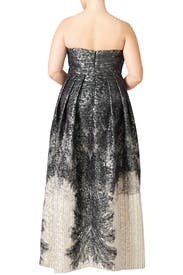 This dress is glamorous and you can see in the fabric and stitching it's high quality. A reporter covering the event actually called me over to ask who I was wearing! I wore a bra with it but could have gotten away without. I wore 5in heels and the length was perfect. Loved the swishy sound it made as I walked and adored the pockets! I'm 5'4", 128 lbs. 34 C in bra. I wore the four which fit snugly. With some high heels the skirt just touched the ground. 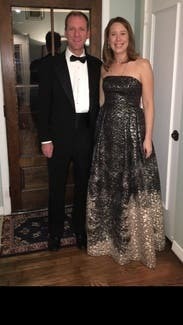 Wore this gown to a black tie gala. Absolutely stunning gown. It is always hard for me to wear strapless gowns since I have a larger rib cage , but small up top and in the hips. I wore a 2 L because there was no regular length. 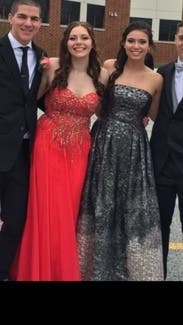 I'm over 5'7" and had to wear the highest platform heels (about 6 inches) I could find and the front still touched the ground. Even at my height I still recommend the regular length. 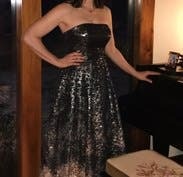 The dress was very comfortable, and was a beautiful shimmery fabric. Many compliments. This gown and I stole the show!!!! 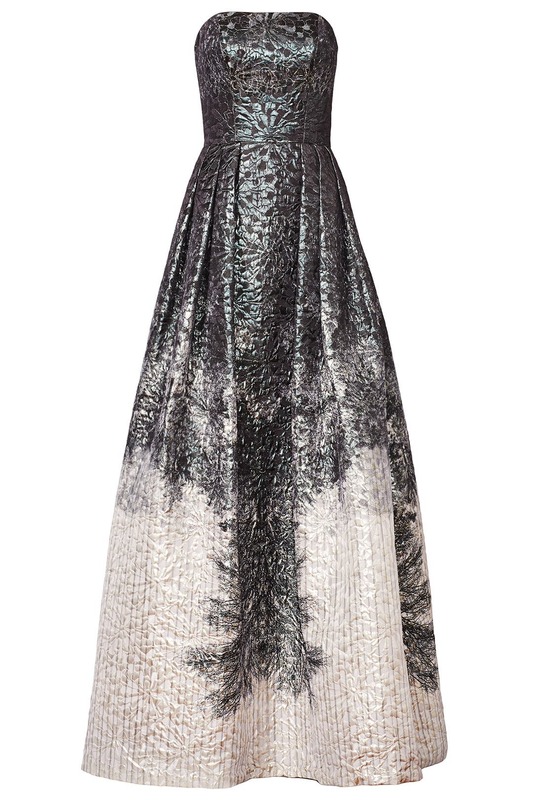 This gown is stunning - and everything about it is stunning. I rented this for my spring voice recital and it was perfect!!!! 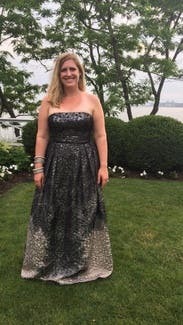 It was big on me and I had to pin it to my bra, but wow what a gorgeous gown, and this was my first experience with rent the runway. Definitely renting again!!!! The dress was stunning, but a bit tight. I suggest ordering your size and one up. Overall loved the dress and got a ton of compliments. 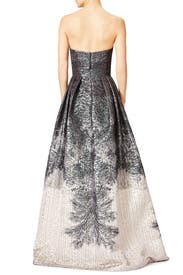 I've rented this Beautiful gown for a formal wedding this coming June 2016 and can NOT wait to wear it!!! It's absolutely Beautiful & unlike anything I've ever rented or worn before. Th bodice fits perfectly mad know I'll not have to mess with it, which is so nice with a strapless gown! Definitely rent this Beauty! You won't be disappointed!!! The dress came and it was more breathtaking than the picture gives it credit for. 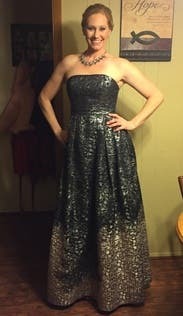 This was my backup style for a black tie wedding and I had to rent it in a 10L instead of my usual 8L (wasn't available). I was able to make it work by adding a super tight belt to hold the dress up. I'm 5'10" & wore 4" heels. It could have been a couple inches longer but was okay to wear. The thick material is very hot. 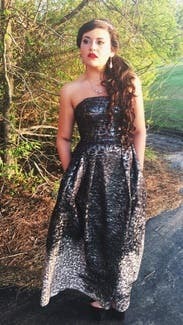 I felt like I had a comforter on LOL but overall it was a nice dress. 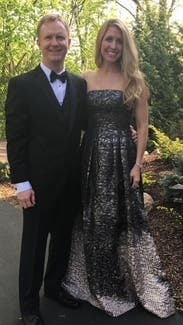 This dress was stunning. Absolutely stunning. I recovered compliments all night on this dress and never felt so glamorous and beautiful. I am usually a size 14 but the 14R was huge on me. The 12 was a tad tight in the bust but it worked out fine. The boning did stick out a bit which was uncomfortable but worth it for the look. Highly recommend. I love a dress with pockets. The pockets are big enough to hold my iPhone 6S Plus and not be visible. With the heels I had on, the dress just hovered over the floor. The bodice is perfect, you don't need to wear spanxs. The dress is so amazing so keep it simple with the accessories. My original choice was not a good fit and I just didn't feel pretty in it. 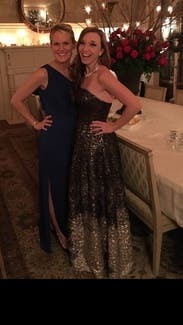 At 6:30pm the night before my gala I called and she couldn't have been more helpful finding me another dress ! It arrived at 11am the next day. I reviewed many compliments on the how and I will definitely be using you again! This dress fits like a glove and is better in person. It fits all types of body styles. I'd choose this dress again and again. The pictures of this dress had me enthralled and it really is an unusual fabric in person. Not only is it embossed, but it's also iridescent, with greens and golds. I didn't wear this dress because even though I sized up, it was still too small. I'd recommend sizing up 1 to 2 sizes. All eyes on this dress at the Metropolitan Fashion Show! This dress was a dream! Gorgeous fabric with multi dimensional color and texture. So interesting to look at. 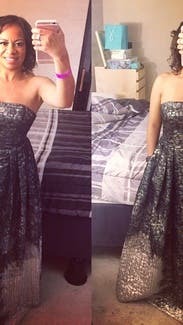 People just couldn't stop staring at this dress! So many compliments! The pockets were fabulous. I wore the extra length with a 2 inch heel. Absolutely loved this dress. Would easily wear/rent again! What necklace did you wear? This is a gorgeous dress, warm for cooler weather and has pockets! I'm 5'2" and had to wear super high heels to keep it from dragging on the floor. I'm also usually a size 6 but rented a 10R because it was the only size available at the time. I'm glad I did because it fit very well. An 8R would probably have worked too but may have been a bit snug in the waist area. Overall I recommend this for formal events. Absolutely beautiful. 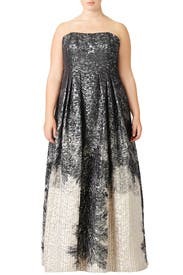 This dress runs between true to size and large. I could've gone a size down, but they didn't have it in stock. However, I made it work! Very comfortable dress, and the pockets were icing on the cake. The fabric is heavy, but still feels light and isn't hot. 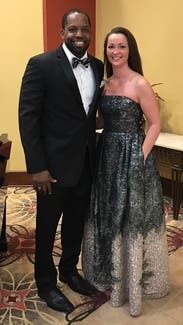 I am 5'2 and wore 3.5 inch heels, then changed into flats as the night went on... so in the regular length at my height you can get away with heels or flats and no one would know the difference.. the dress is a great length. 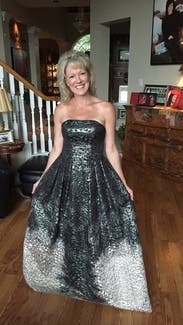 The dress of the gala! 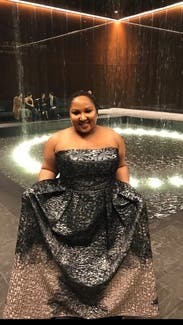 This fit exactly like a ball gown and was long enough for me and 2 inch heals. 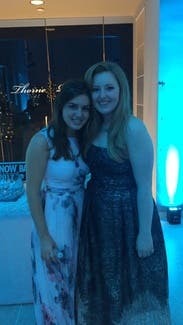 The dress was so beautiful and comfortable. Got so many compliments. The perfect party dress for any occasion. Normally wear 14 dress size and it was a perfect fit. The length was great as I am 5"3" and wore a 2" heel. 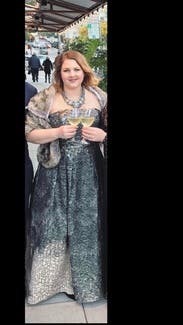 I wore this to a gala event and would totally rent it again. The dress is gorgeous and I got a ton of compliments. And it is truly comfortable! The pockets are awesome and the structure in the upper part of the dress (boning and inner bra support) were great for someone with a fuller chest like me. BUT...I would say the dress runs abut large--especially up top. And for someone with a DDD cup, that's saying a lot. I'm a pretty solid 14 at the moment and it was so big when I first tried it on that there was no way I could have worn it like that. I had to buy a super structured and padded bra to make it work--and even then I had to pin the back to my bra to keep it up. So if I rented it again, I'd size down. Also, it's pretty short! 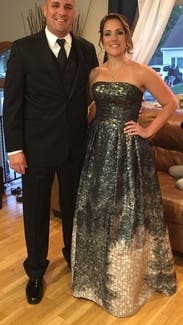 I'm only 5'4" and I could not have worn more than the kitten heels I had on without it looking weird so if you are any taller, get the long version. The fit was fantastic! Like a glove, the material is thick perfect for winter. The fabric is a silver and black with iridescent shine as well, like a snowflake colors change as light bounces off it, so so gorgeous! Felt just as beautiful in my wedding dress as this gown. First RTR definitely not the last! Fit was perfect for someone bigger in the chest. 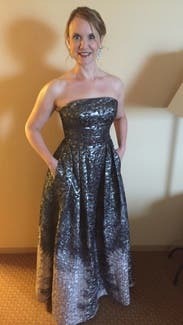 I loved the weight of the fabric - very expensive feeling and grand for a ball. This was certainly a crowd pleaser and made me feel so elegant. 3 days after my prom, I'm still getting compliments on how great I looked. Fantastic dress for a fantastic occasion.